Harry C. Stutz changed the name of the Ideal Motor Company to the Stutz Motor Company in 1912 (after just one year). They built some of America’s best cars in the 1920s and into the 30s but the company closed their doors in 1935. In 1968, the Stutz name was resurrected by James O’Donnell to build a great new design by Virgil Exner. The first cars were two-door coupes and convertibles. They began production of a sedan in 1979 called the IV Porte (four door). It was based on the Pontiac Bonneville/Oldsmobile 88 Royale of the era and this car is powered by a 165 horsepower 5.7-liter V-8. 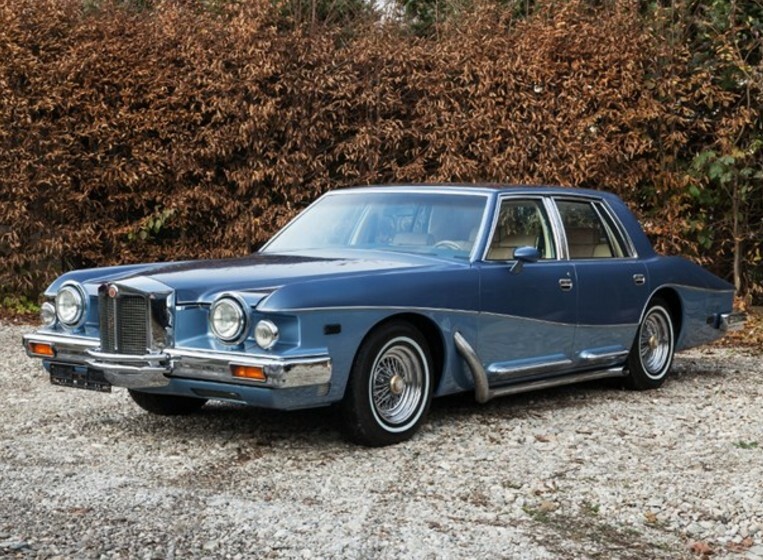 Production of the IV Porte stopped in 1981 and was succeeded by the Stutz Victoria. Only about 50 of this model were ever built. This example has only covered about 2,600 miles and was in a German museum for 30 years. It has a partially gold plated interior, side exhaust and rear mounted spare. These are very distinctive cars and somewhat collectible. The bidding starts at $42,500. Click here for more info and here for more from this sale. This entry was posted in Uncategorized and tagged 1981, auctionata, auctions, cars, classic cars, iv porte, stutz by classiccarweekly. Bookmark the permalink.